Kurt T. Weinberg raised his hand to take the oath of office from Henrietta Gates, chairwoman of the Montserrat Board of Trustees. 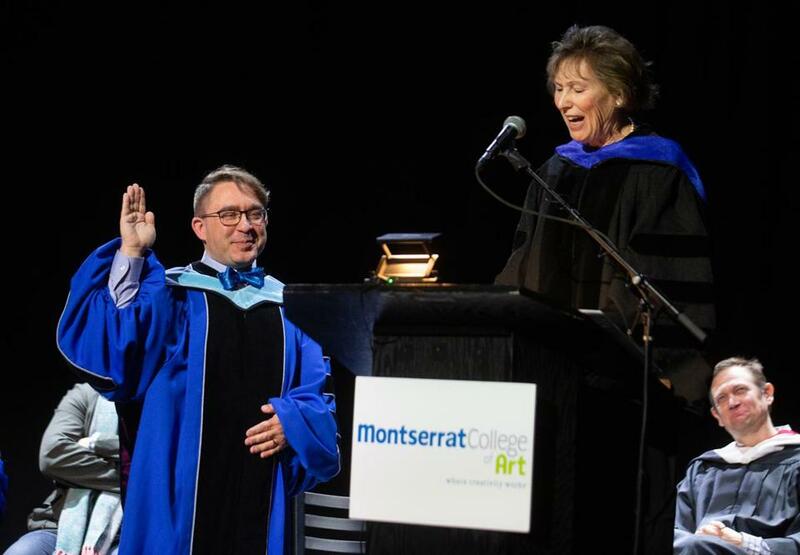 Montserrat College of Art in Beverly inaugurated Kurt T. Steinberg as its eighth president during a ceremony attended by representatives of colleges from across New England. Gov. Charlie Baker, State Senator Joan Lovely and other public officials “offered greetings at the start of the ceremony,” held last Friday at a The Cabot theatre, the college said in a statement. Four former presidents of the private college were also on hand, along with a founding faculty member. Also in attendance was Kay Sloan, president emerita of Massachusetts College of Art and Design (MassArt), where Steinberg was the executive vice president, prior to starting at Montserrat last July. Steve Locke, a faculty member at MassArt, delivered the keynote address. In his inaugural address, Steinberg called for innovation in art and design education. “The history of Montserrat does not allow for the status of playing it safe to exist,” he said of the college founded in the late 1960s by a group of artists. He said that Montserrat students need to be brave and be curious and not allow the opinions of others to stifle their ideas.